The past week has been an especially tasty one in the blogosphere as forward-minded bloggers published post after post of amazing dishes that would make any Thanksgiving table proud. Simply Bitten Kitchen gave us cornbread dressing (along with the cornbread for said dressing), cranberry sauce, and turkey wings. A Pug in the Kitchen also offered cranberry sauce and dressing along with potato rolls, a centerpiece-worthy turkey complete with gravy and sides, pie, and even wine suggestions. These are two of oodles of blogs that published Thanksgiving recipes in a timely manner. If you are hosting a Thanksgiving meal or providing at least a component, you would have read their posts and still had plenty of time to whip up the recipes. Then there is food for fun. My blog. Where you will indeed find a stand-out recipe for a lovely baguette–developed by a Jesuit priest, for goodness’ sake–posted very late in the eve before the day that is Thanksgiving. This is the bread I will be bringing to my mom’s Thanksgiving feast. We will slice it and slather it with butter and maybe spread some cranberry sauce on it or even dip it in gravy. It will be heavenly. I will also slice up a loaf and turn it into Sweet Potato Crostini as seen in a Taste of Home back issue and offer it as an appetizer. But sadly, Brother Curry’s recipe will not help you this November 28. For who has time to make this bread–with its 10-hour rise time–for their Thanksgiving meal? I apologize for this. My bad. Just the same, I offer you a photo, recipe, and hopefully a feel for how easy it will be when you do have time to make this bread. It doesn’t need a holiday to be enjoyed, no. Make a batch (you’ll be richly rewarded with three loaves) and enjoy for breakfast, lunch, supper, and any time before or after any of those meals. Eat it plain, spread it with butter/jam/honey, make turkey sandwiches with it, float thin slices atop soup. You’ll find plenty of ways to enjoy these baguettes. Though I am unable to help American folk fill their Thanksgiving table, I still want to wish all a blessed Thanksgiving. The blogging community–readers, Likers, commentors, followers–is high on my list of what I am thankful for. Blogging has brought amazing friends and helped me stretch my writing wings, take a few more risks. I’ve learned how to use my camera’s photo editor and my recipe collection has expanded exponentially. Never in my wildest dreams did I imagine the blogosphere to be so rich. A sincere and heartfelt thank you to all. In that vein, I’d like to especially thank Ada, of More Food, Please and Shanna, over at Curls and Carrots. Both ladies, besides offering first-rate content on their respective blogs, have supported my endeavors with their thoughtful and enthusiastic (and just plain fun) comments both here and over at deLizious facebook. Over the past few months, they’ve honored me with their nominations for Dragon’s Share, Versatile, Sunshine, Blog of the Year 2013, Dragon’s Loyalty, WordPress Family, and Best Blogger Ever of All Time (haha, just made that last one up) Awards. I love that you enjoy what you read here, Ada and Shanna. Many many thanks. You ladies rock. While there are official rules for accepting these awards, I’m going to mix it up food blogger-style. Instead of answering questions and nominating others, I offer you a recipe. Makes as many servings as you think you can handle. 1 ukulele phenom at What Do You Do for an Encore? Click on links. Read, then laugh, drool, swoon, ponder, smile, etc as appropriate. Click Follow if you want another serving. One more thing: I already sent you to Curls and Carrots above, but if you haven’t yet clicked over, I’ll send you directly to Shanna’s recent granola bar post. She claims she took inspiration from last week’s food fun for granola bar post, though even if that’s the case, she’s far surpassed anything I could have done. You must see these! From The Secrets of Jesuit Breadmaking by Rick Curry, S.J. In large bowl, combine yeast, 1/2 cup water, and the sugar, stirring to dissolve. Let stand 5 minutes. Add remaining 3/4 cup water, the salt and 2 cups flour to yeast mixture; beat vigorously 3 minutes. Beat 5 minutes longer, continuing to add remaining flour until dough pulls away from side of bowl. Turn dough out onto lightly floured surface. Knead 8 to 10 minutes or until dough is smooth and elastic, adding flour as needed to prevent stickiness. Let dough come to room temperature (lucky me–mine already was). Heat oven to 450ºF. Turn dough out onto work surface. 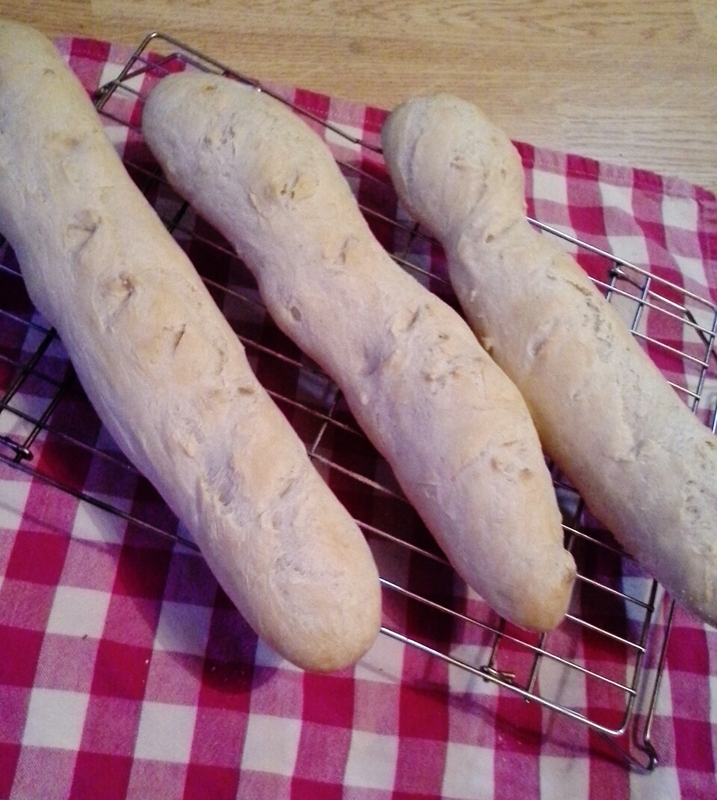 Divide dough into thirds; shape into baguettes. Place dough on trays. Cover with tea towel; let rise 20 minutes or until doubled in bulk. 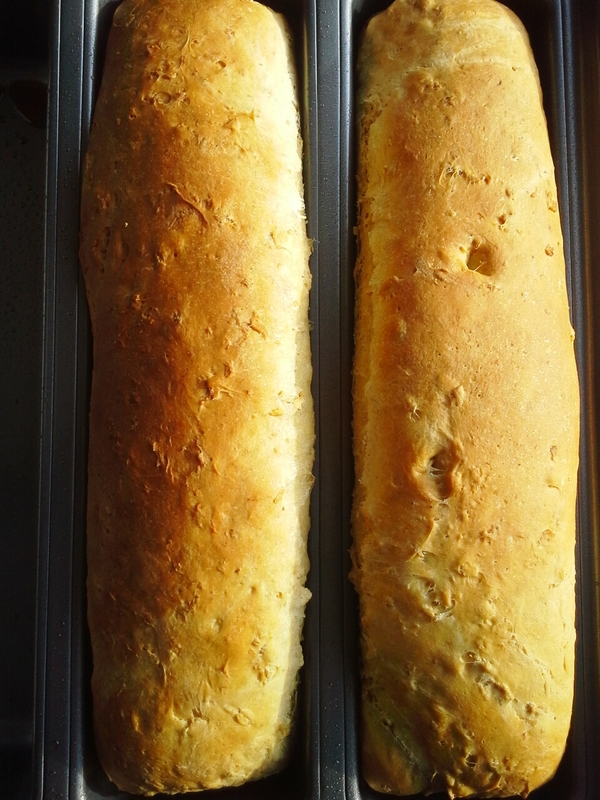 Spritz loaves with water. (Original recipe recommends spraying with vinegar, which I didn’t understand. Anyone know why this would be a good thing?) Make seven slashes in each baguette (so says Brother Curry). Bake 10 minutes; spray with additional water. Bake 10 minutes longer or until golden brown. Transfer to wire racks to cool. Needing a topic for this post, I thought back to starting food for fun. With so many great food blogs already out there, I knew I needed a niche. While I didn’t know what that niche would be (still not entirely sure, btw), I jumped in and started writing. Topics have been chosen solely because they inspire or excite me enough to want to share. You’ve read of obsession with all things marshmallow (here and here). You’ve read a post outlining obsessive stalking following of The Weary Chef’s Happy Hour. (A much earlier post had offered only four cocktail recipes.) You’ve seen batch after batch after batch of homemade ice cream, one even damaging my phone. Then there were the four batches of caramel sauce (in. a. row.) to achieve a dark enough color. And the most recent “project” using 24 overripe bananas in as many hours? Yes to obsessive. With the banana post in particular, more than one facebook comment suggested that I was possibly a bit bananas myself. So here’s my question: Do folks blog because they are obsessed enough about a topic that they absolutely have to write it up and put it out there for others to read? Are all bloggers bananas? Everyone writes for their own reason, so I wouldn’t presume that all come from a place of obsession. But I know absolutely that there’s oodles of passion behind a blogger’s reasons for writing, no matter the topic. And maybe your blog serves the purpose that mine does for me: to legitimately attend to my obsessions. The puree went into Barefoot Contessa’s Banana Sour Cream Pancakes, which could pass for dessert as easily as they could breakfast. The bananas are added to the top of the ‘cakes before flipping, adding a flavor hit bar none. (“Bananas in a basket!” read one facebook comment.) Thanks, amb, for pointing me toward a killer recipe. 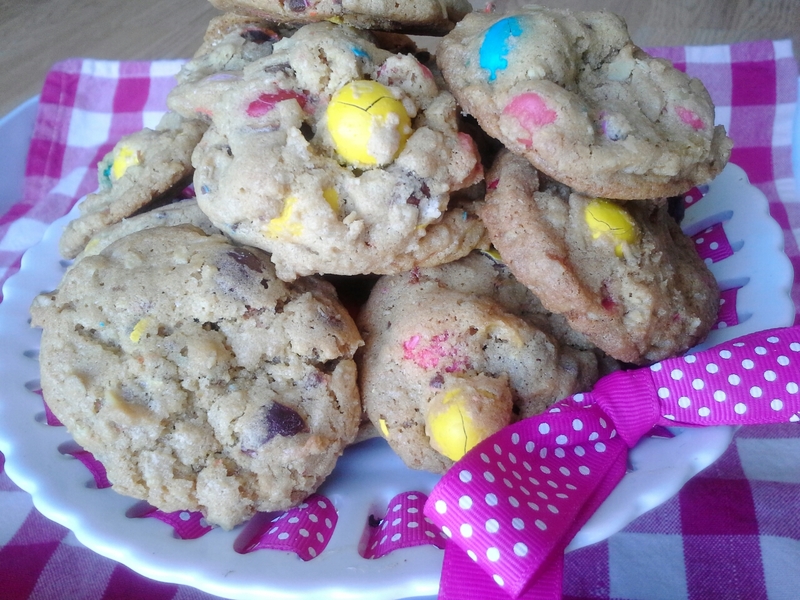 Though some would have stopped at one banana recipe, I had Trace in the Kitchen’s Banana Chocolate Chip Cookies to make. 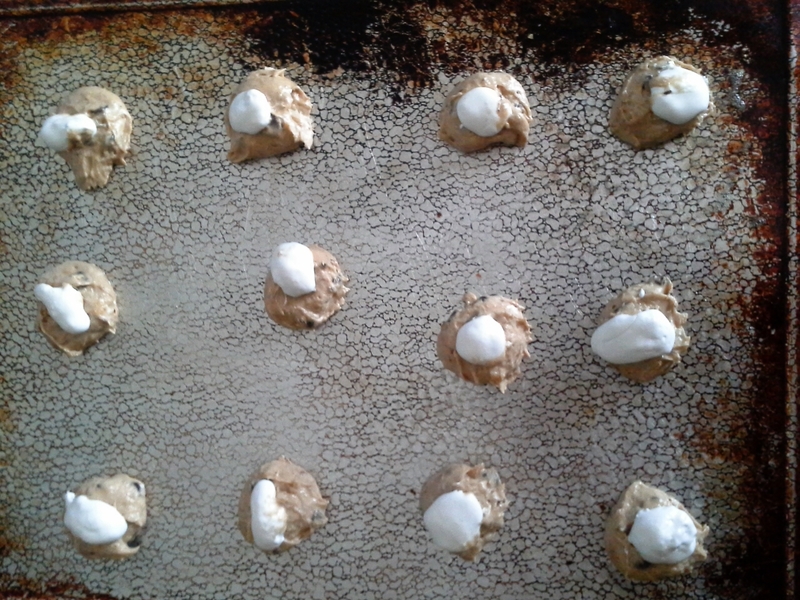 Only changes: upping the 3/4 cup chocolate chips to 1 cup as that last 1/4 cup was begging to be used and adding a dot of Marshmallow Fluff to each dough ball just because I could. 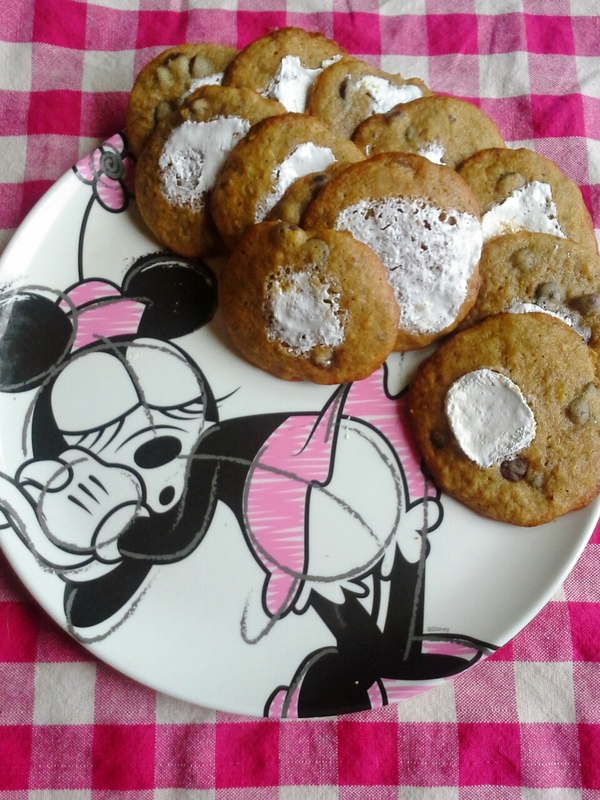 These cookies were as tasty and soft and dreamy as Trace had promised. Thanks, Trace in the Kitchen, for a fun recipe! Next up was Saucy gander’s Ultimate Banana Bread, which included the extra step of draining thawed frozen overripe bananas, then reducing that liquid by half and stirring it back into the puree. It calls for whole wheat flour–a plus–and its crowning touch is a layer of shingled banana slices sprinkled with caster sugar. The cupboard bare of caster sugar, I grabbed a bottle of coarse pink sugar (found in the cupboards of moms of young girls everywhere), though next time will use coarse sanding sugar as the pink didn’t do it for me. 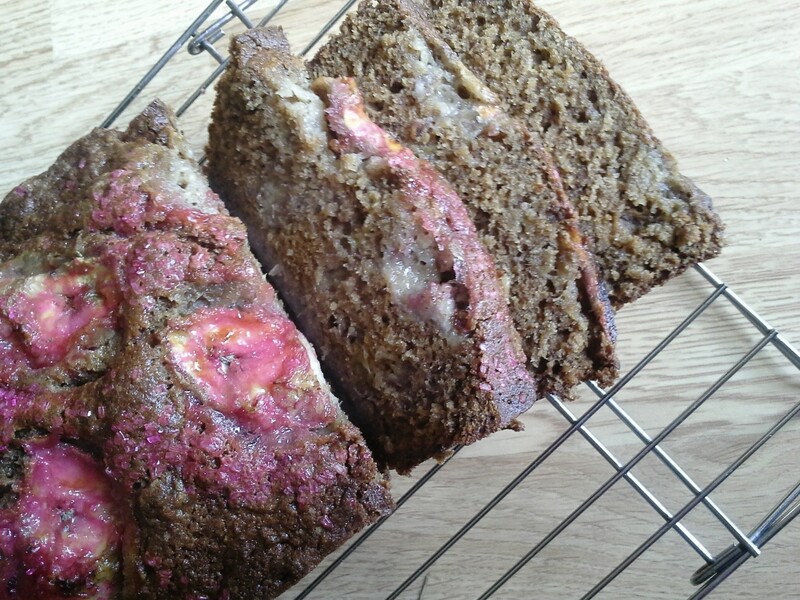 But the banana bread itself was a winner. Removing some of the water from the mashed bananas heightened their flavor, making the final bread richer and more darkly banana-y. Also on my list were these delicious-looking peanut butter banana chocolate bars from Kelli’s Retro Kitchen Arts, though a closer look revealed banana cake mix, not fresh bananas. The photo looks so amazing, I’ll eventually find a way around the cake mix dilemma and come up with a version for my brandy-roasted bananas. And that, I hope, is the end of my banana tale. I raise a (Weary Chef) cocktail to bloggers everywhere, celebrating our obsessions, passions, and willingness to share. Thank you for reading about mine. While I was up for the challenge, it hurt to shun grains, legumes, and fruits as they add variety to a daily diet and have so much to offer nutritionally. But working for a client, I pushed personal feelings aside and stepped up to the no-carb plate. While I made some progress (Venison-stuffed bell peppers? Salmon salad? Winners both. ), there were a few recipes I just couldn’t like. (Talking to you, spinach bread and kale smoothie.) More tweaking lies ahead, but by the end of the weekend my kitchen needed some carb karma. Oatmeal cookies seemed a good choice, so I put together a batch using a recipe clipped from the newspaper years back. Chocolate chips were replaced by a handful of leftover red and pink m&m’s, another small amount of red “chocolate” chips (must have hit the day-after-Valentine’s rack at the grocery store), and a much larger amount of pretzel m&ms. The cookies were fantastic and loved by all; just by baking them I started feeling better about my no-carb recipes. My husband, a willing if wary no-carb taste-tester, must also have been scarred by my project as he announced today that he was going to bake bread. While not completely out of character for him, it’s been ages since he’s made bread and his declaration cracked me up. He, too, must have sensed the kitchen’s need for carbohydrates. His chosen recipe was a no-knead oatmeal loaf and when time came to put the dough into pans, he happened upon my new loaf pan. Sold as a three-slot lasagna pan, this “kitchen toy” was recommended by a friend who uses it to bake multiple types of quick bread at once. Hubby’s bread dough filled two of the three slots, giving us two spectacularly amazing soft, fragrant, and golden loaves of carbohydrate bliss. I get that consuming excess carbs can pack on the pounds. I get that protein and fat satiate in ways that carbs cannot. But I also believe that there’s room in a healthy diet for carbs–especially the whole grains that provide fiber and lots of B vitamins. While I’m not fond of the mantra “everything in moderation” (everything? really? there goes the moderation, then), it does apply to most food situations. No-carb diets may be important for folk in critical health situations and may also help jump-start weight loss. But I’m all for including some of (almost) everything in what I eat. Kale and spinach. Cookies and bread. I’ll gladly make room for all of it. If you feel likewise, here are two rock star carb recipes. Heat oven to 325°F. Coat baking sheet with cooking spray. In bowl, beat together butter and brown and granulated sugars with electric mixer until smooth and creamy. Add egg, yolk, and vanilla, beating until combined. In separate bowl, combine flour, oats, baking soda and powder, and salt; mix well. Add to butter mixture; beat on Low speed until blended. Stir in m&ms. Drop tablespoons of dough at least 2 inches apart onto baking sheets. Bake 13 to 16 minutes or until cookies just begin to brown at edge. Cool briefly on baking sheets; transfer to wire rack to cool completely. Makes about 60 cookies. 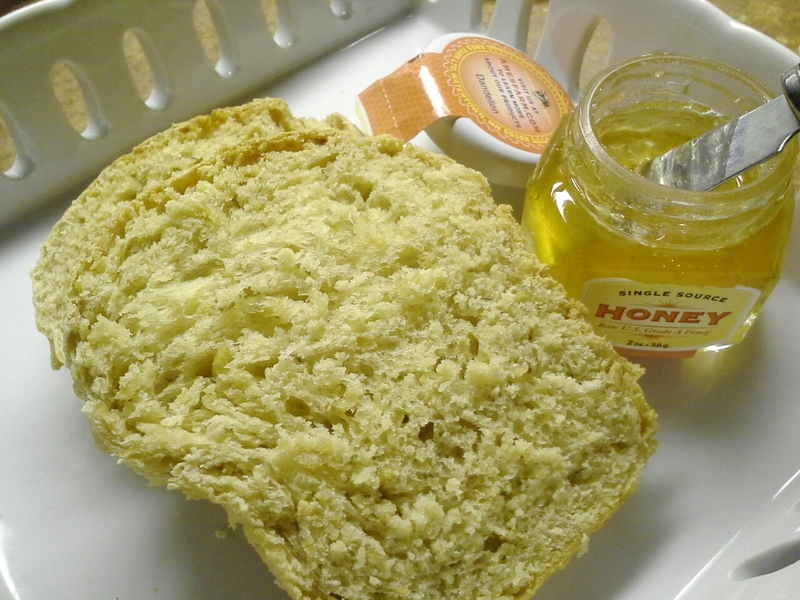 In large bowl, combine boiling water, oats, honey, butter, and salt; cool to lukewarm. Add yeast, mix well. Blend in eggs. Add flour until well blended yet still a soft dough. Place dough in greased bowl; cover. Refrigerate until needed, at least 2 hours. Grease 2 (9×5-inch) loaf pans. On well-floured board, shape dough into 2 loaves. Place in pans; cover. Let rise 1 hour or until double. Bake at 350°F 1 hour or until loaves are golden brown and sound hollow when removed from pans and tapped on the bottom. Makes 2 loaves. I’m continually amazed that the 1980s were so terribly long ago. It doesn’t seem more than a handful of years back that I was wearing baggy pinstripe Zenas (!) and listening to the likes of Toni Basil. (For a hysterically funny take on how time flies, Becky’s thoughts on such things is so worth a read.) Children of the ’80s are all grown up by now and have since realized that shoulder pads perhaps weren’t the smartest fashion move (though I think they might be coming back–hoo boy) and big hair was, well, too big. Those who claim the ’80s as their “formative years” now have smart phones, real jobs, families. Consider Andrew McCarthy, leading man in classic ’80s cinema: Class, Fresh Horses, Weekend at Bernie’s, Mannequin (an underrated movie if there ever was one), Pretty in Pink, St. Elmo’s Fire. Food for fun won’t focus on the movies (my blogging buddy, amb, can help you there–she’s the best), but rather the fact that Andrew McCarthy is also all grown up now. He’s a food writer! The March ’13 BA features his tale of traveling twisty and narrow roads in search of the best banana bread on the planet. A land-locked Midwesterner, I hadn’t known that Hawaii is said to be home to the very best of the banana breads and I enjoyed reading McCarthy tell of his visits to a handful of off-the-beaten-path roadside huts known for this all-American quickbread. 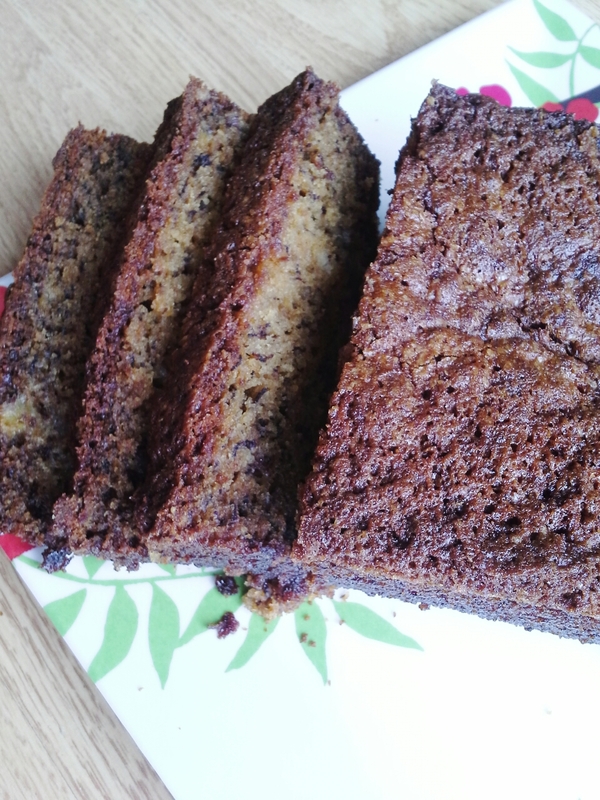 The recipe for Julia’s Banana Bread was given, citing it as the top banana of the banana bread world. When sharing this story with a friend, I learned of her trip to Hawaii a few years back when she, too, went on a pilgrimage for this bread, inspired by tales of locals. Hours after setting out, her party finally made it to the tiny hut only to learn Julia’s was out of bread for the day. A downer for sure, but now thanks to the all-grown-up Andrew McCarthy, Julia’s banana bread is available to all. Calling for the most basic of ingredients (eggs, flour, baking soda, sugar, salt, bananas, oil), it was an easy loaf to whip up. I’ll admit to fighting urges to tweak: oh, how I wanted to add a pinch of cinnamon or ginger, a handful of chocolate chips, sub out half of the all-purpose flour for whole wheat. But I stood strong, if only out of respect for McCarthy and his craft. Sticking to the formula was worth it. 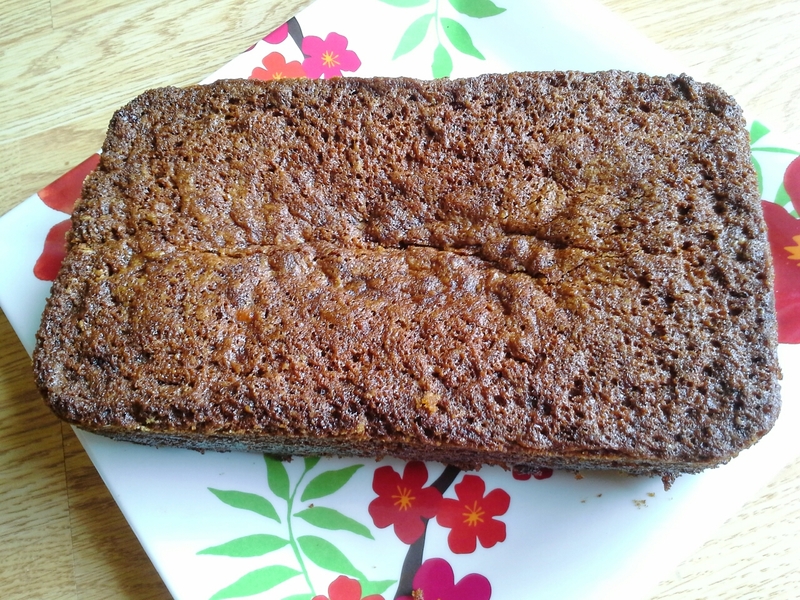 Largely because of the 1 1/2 cups sugar, 3/4 cup oil, and 3 eggs, it is arguably the best banana bread ever. Sweet, freckled, moist, likely what you’d find if you looked “Perfect Banana Bread” up in the dictionary. To children of the ’80s–or whatever decade you call your own–I strongly advise you to bake up your own loaf of tropical paradise. For those who want a more authentic experience, watch this bizarre YouTube clip just before eating your first slice. This never would have been possible back in the ’80s. Tonight’s recipe is the happy result of a fun virtual connection. A few weeks back I guest-blogged my first post on a favorite WordPress site. I first visited Blog of Funny Names just under a year ago and was quickly hooked. Well-written, smart, and occasionally irreverent, BoFN offers background on random funnily named folk and–sometimes–geographical locations. I welcomed the opportunity to contribute the occasional funny (food) name, and started things off by writing up cookbook author and writing guru Crescent Dragonwagon. My post appeared to go over well enough, but I had no expectation of actually connecting with my subject. Imagine my surprise when a friend gave me a heads-up that Crescent Dragonwagon–a woman I had come to admire greatly after my online research–had somehow found my BoFN post and shared it on her facebook page. I quickly shot off a note of thanks to Crescent and she graciously responded and even dropped over to my deLizous facebook page. Two of her cookbooks, The Cornbread Gospels and Bean by Bean, now sit on my shelf. Excited to put them to good use, I brought the cornbread book into the kitchen today. Crescent’s recipe for “Thirded” Colonial Cornbread looked to be exactly what the afternoon called for. Because Crescent is an established cookbook author and food writer, I guessed that any recipe in her books would be a winner. What I hadn’t counted on, though, was how lovely these books would read. Her intro to the Thirded cornbread taught me that early Colonial Americans made doughs using one-third each rye flour, cornmeal, and whole wheat flour “in order to stretch their thin and dear wheat supplies.” She went on to mention that this particular bread “is can’t-stop-eating-it delicious a few minutes out of the oven, with a little butter. It’s still good that same day, goes quite nicely with vegetable soup or stew, and can be split, toasted, and gussied up with sharp Cheddar cheese melted on each half.” Good information for sure, but it’s also extremely well-crafted prose. I look forward to delving further into Crescent’s books–both for recipes and reading pleasure. But about that recipe: “Thirded” Colonial Cornbread turns out a lovely pan of hearty and wholesome (and addictive, as Crescent noted) cornbread. The rye was barely noticeable (a plus as my 6- and 10-year-olds would’ve turned their noses up at such a strong flavor) and because whole wheat pastry flour was used, the whole wheat flavor was more of a background note as well. What did come through was a complex earthiness sweetened only slightly (but just enough) by molasses. (Though I subbed in sorghum as I didn’t have the blackstrap called for.) I also added the 1/4 cup sour cream and 1/4 teaspoon baking soda recommended for a moister bread. 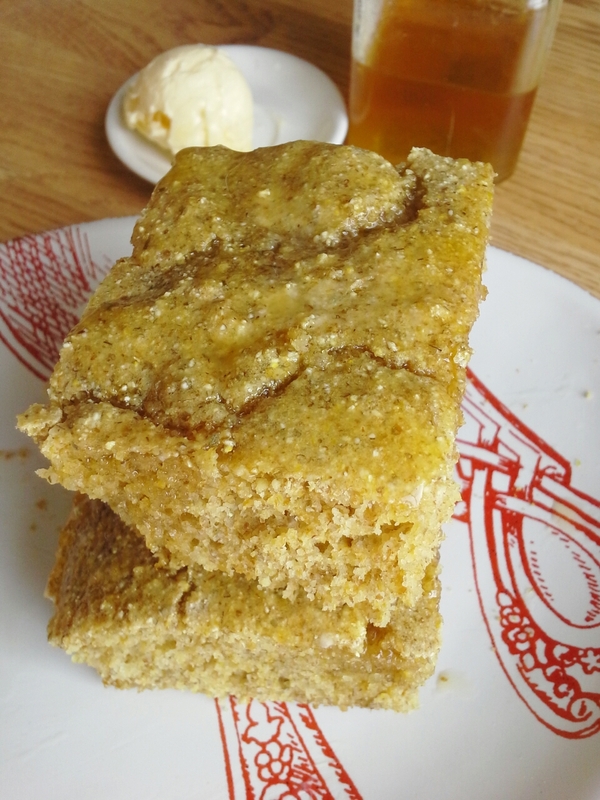 This cornbread was crumbly, but also firm and it held together well. It seemed the perfect balance of light and dense. I see it working with all of Crescent’s suggestions: a side for soups and stews, a base for bread pudding or French toast, crumbled into stuffing. I’m also excited to top it with honey, yogurt, and berries for tomorrow’s breakfast. 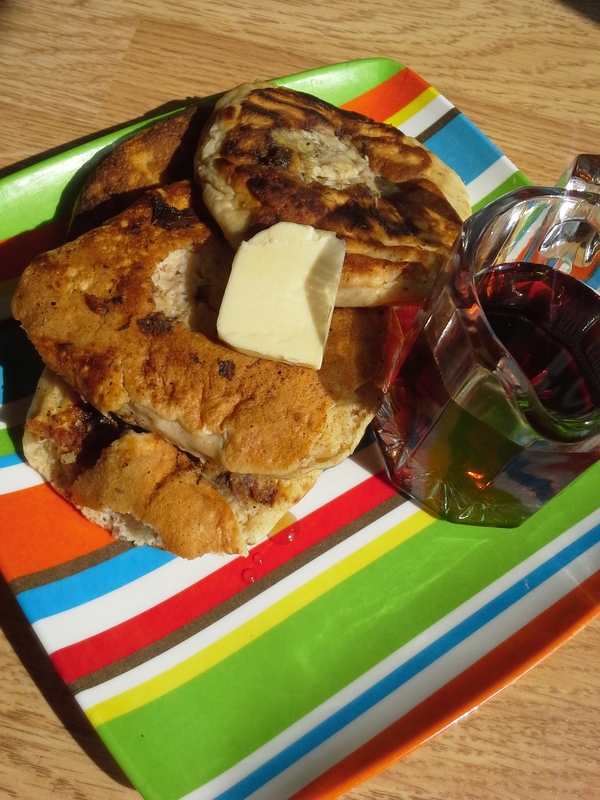 When I started my blog, just over a year ago, my only plan was to write up fun food finds. It’s been gratifying to see posts take shape, but it’s been even more rewarding to connect with other fun folk–foodie and otherwise. I treasure all of these connections and thank all who read foodforfun. Thanks, as well, to Crescent Dragonwagon. What started as a search for a funny name ended with a delightful new connection and a pan of amazing cornbread. Heat oven to 375°F. 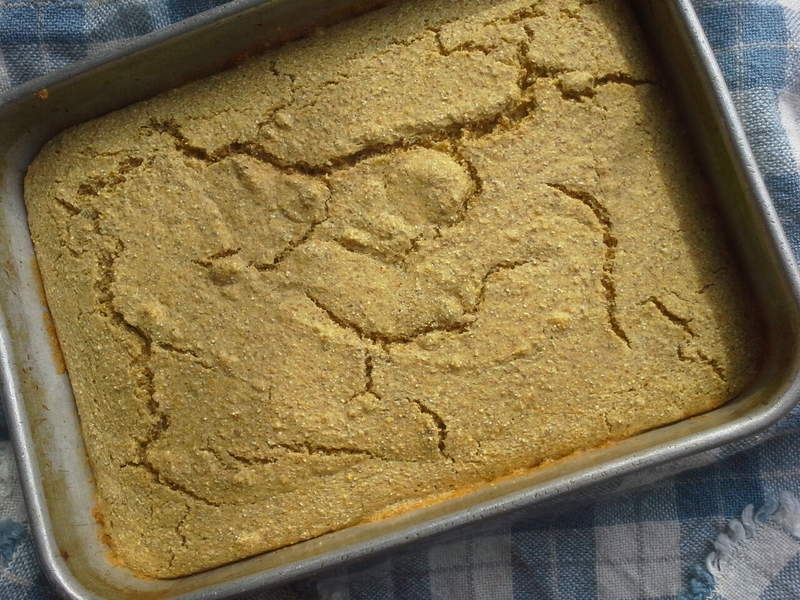 Coat an 8×11-inch baking pan with cooking spray. Sift together the cornmeal, rye flour, whole wheat pastry flour, baking powder, and salt in a medium bowl. Set aside. Measure the butter or oil by tablespoon into a small skillet or saucepan, then, using the same thus-greased tablespoon, measure in the molasses. Place on low heat to thin the molasses and melt the fat. Beat the eggs into the milk in its measuring cup, and then stir in the warmed molasses and butter. Combine the wet and dry ingredients with as few strokes as possible (the batter will be much darker than typical cornbread batter). Transfer it to the prepared pan. Bake the cornbread until it is firm and deeply brown, with browned edges slightly pulling away from the sides of the pan, about 30 minutes. Makes about 12 squares. I expected to write up a blog post last Friday, just like I have every Friday before for nearly a year. Except that I couldn’t. News of a school shooting made the rum cake I wanted to feature seem unimportant. And I still struggle–along with countless others, I know–with finding significance in anything other than family and children and those we hold dear. I always professed this blog–foodforfun–to be only about fun food and drink. But today I have to step out a bit further and connect food to feelings that are decidedly not fun. When I dropped my girls off at school this morning, I found myself lingering. Maybe I was picking up on something that wasn’t, but there seemed a sense of urgency in the halls. Smiles were everywhere, but I imagine teachers and parents had their own private thoughts–ones that could not and would not be communicated to the kids heading into their classrooms for the day. I’ve always thought teachers to be underpaid and (mostly) under-appreciated. This is the workforce that educates our future. They’re not in it for the money; most teachers teach because they believe in what they do. And now this. My feelings are shared by many and it may be that now we’ll do more to show our appreciation. I was wowed by the mother of one of my daughter’s classmates: She, her husband, and both of her children arrived at school this morning carrying a large pot of coffee and an oversized cookie tray. The gifts of food and drink were their way of showing teachers they were appreciated. Wanting to show my gratitude, I had conversations with a few of my daughters’ teachers, thanking them for doing what they do. But I wanted to do more. I went home to bake bread. Today’s loaves count nine and I’ll deliver them tomorrow to teachers at my daughters’ school. 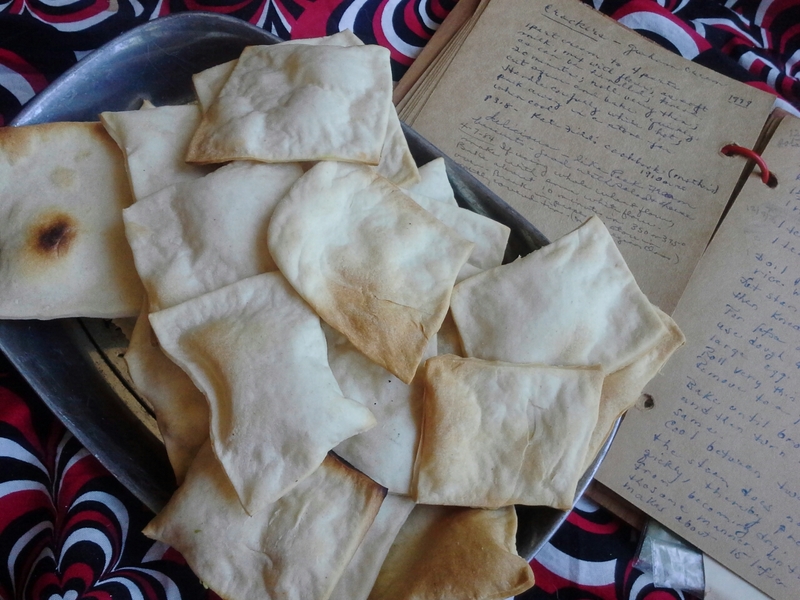 While baking this bread is meant as a gift of thankfulness, it helped me in ways I hadn’t expected. Stirring together a triple batch of dough, then wrestling it into submission, helped me work out some of the aggression and sadness that I feel. I’d love to find a metaphor for this bread and the peace we’d like to see in our communities and in the world. But instead I’ll settle for knowing that these loaves are nourishment and teachers everywhere need to be nourished now more than ever. I ask you to let a teacher know he or she is making a positive difference. Buy a cup of coffee, offer a smile and a kind word, say thanks. And if you’re a bread baker, give this (peaceful) loaf a whirl. In large bowl, combine whole wheat flour, yeast, and salt. In saucepan, heat butter, milk, water, molasses, and honey until warm and butter is partially melted. Pour into whole wheat mixture; stir well. Stir in oats and eggs. Beat 10 minutes, gradually adding bread flour until dough begins to pull away from side of bowl. Place dough in lightly oiled large bowl; turn to coat on all sides. Cover with plastic wrap. Let rise in warm, draft-free place 1 1/2 hours or until doubled in bulk. Heat oven to 375°F. 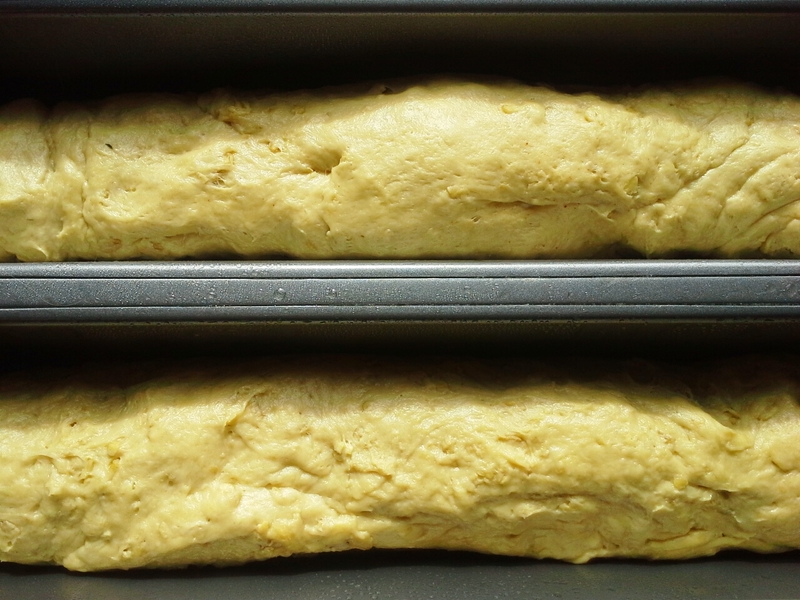 Grease 3 (9×5-inch) loaf pans. Punch dough down. Divide into thirds; shape into loaves. Place in pans. Cover with tea towel; let rise 45 minutes or until doubled in bulk. Bake 30 to 35 minutes. Transfer to wire rack to cool. 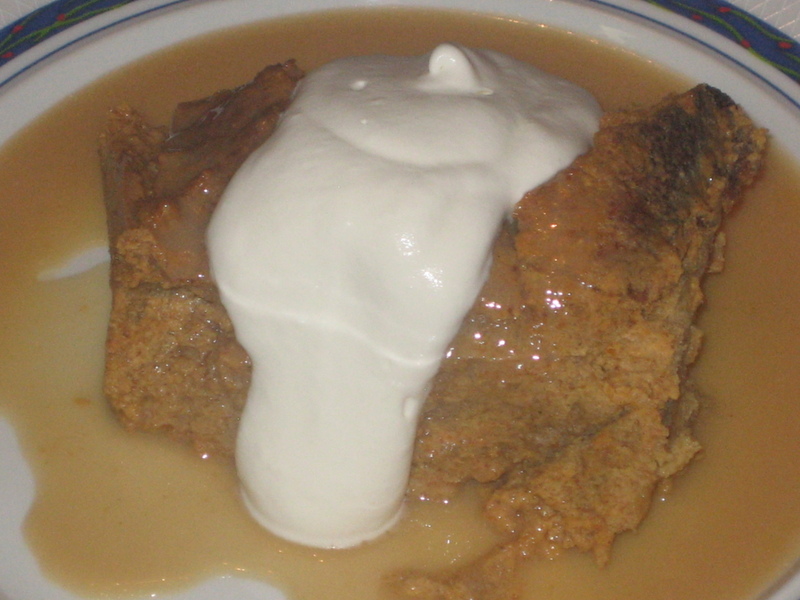 I have collected a fair number of cans of pumpkin puree (thank you, neighbors), so a recipe for Pumpkin Bread Pudding recently caught my eye. Being the only one in the house who enjoys bread pudding doesn’t deter me from making it. I can easily justify enjoying the whole batch myself. It counts as breakfast, yes? Tonight was the night for the bread pudding. Topped with a bourbon sauce (isn’t all bread pudding supposed to be served with some type of whiskey sauce?) 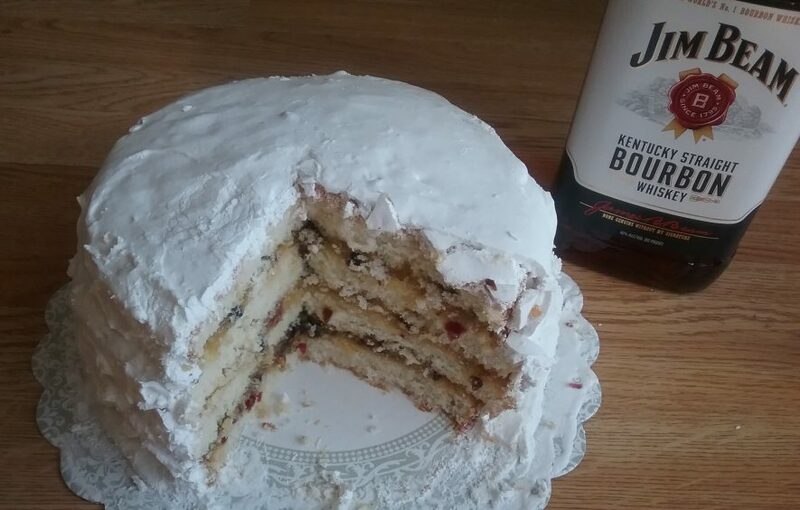 and a cloud of whipped cream (yes, laced with bourbon), it was swoon-worthy. The pudding itself isn’t overly sweet and has a beautiful almost pumpkin pie-like texture. As a bread pudding, though, it is decidedly hearty and rustic–even more so than some as it started with a loaf of fairly dense mulitgrain bread. I was trying to use up a rather large (17-ounce) round loaf of multigrain bread (gift from same neighbor), so this replaced the baguette called for in the recipe. I sliced it 1/2 inch thick per recipe instructions, but my loaf was so much larger than a narrow baguette, the slices were anything but delicate. Just the same, I toasted it in the oven per recipe instructions and tore it into large pieces before soaking it in the egg mixture. In the end, I like how the irregular-size pieces meld together in the custard. I also didn’t have 1 quart half-and-half in the house. It would have been easy enough to mix 2 cups cream (which I did have) with 2 cups milk, but this was one of those times (and we all have them) when we were milk-less. I don’t know too many fans of powdered milk, though it does come through in a pinch when baking. My “half-and-half” was 2 cups liquid milk made per powder box instructions stirred into the same amount of cream. Instead of the dark brown sugar I usually make (1 cup white sugar plus 2 tablespoons molasses), I made a lighter version by replacing 1 tablespoon molasses with the same amount of dark honey. Also, the original recipe toasted the bread and baked the pudding at 300°F. I bumped up the second bake temp as I wanted faster baking and some browning on the surface. Adapted from a recipe found in Everyday Food (November 2003). Note that my recipe looks nothing like what was intended. Tasty just the same. Heat oven to 300°F. Coat 9-inch baking pan with cooking spray. Place bread on baking sheet. Bake, turning slices over once, 20 minutes or until lightly toasted. Remove from oven. Tear into large pieces. Meanwhile, in large bowl, combine eggs, milk, cream, pumpkin, brown sugar, spices, vanilla, and salt; whisk until blended. When bread is toasted, add to bowl; push down to submerge. Let soak 20 minutes or until saturated. Heat oven to 325°F. Pour bread mixture into baking pan. Bake about 1 hour or until knife inserted in center comes out clean. Makes 12 servings. In small saucepan, bring all ingredients except vanilla and salt to a boil. Boil 5 minutes or until just slightly thickened. Stir in vanilla and salt. Makes about 1/2 cup. In bowl, whip heavy cream to make whipped cream, stirring in a splash of bourbon and just about as much powdered sugar. 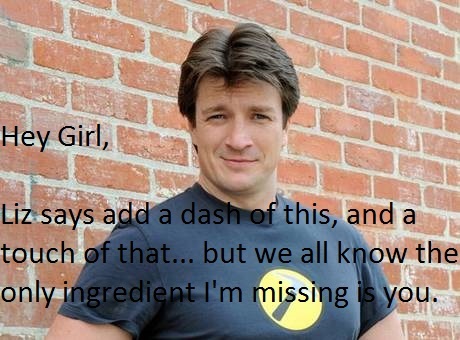 What does Nathan Fillion have to do with bread pudding? Absolutely nothing. This is why he’s here.